Thursday January 23 1908 I was busy with the work all forenoon. We were very late in getting up. I baked bread and churned. Will to town in afternoon. When he came home he salted the meat. Mollie came out to stay all night We had such a good visit. a cold sharp night. Friday January 24 1908 I hurried through my work and went to town at 9.37. I did some errands and was at Dr Smiths office. I went over home for dinner, not coming back till 5.20. I made a pair of pillow cases and worked on my tatting. Saturday January 25 1908 It was so late when we got up that I did nothing but the house-work in forenoon. Will went to town at 12.37 and I had "Nellie" hitched and went down to Woolfs for the afternoon. It was so pleasant today. I worked on my tatting what spare time I had. 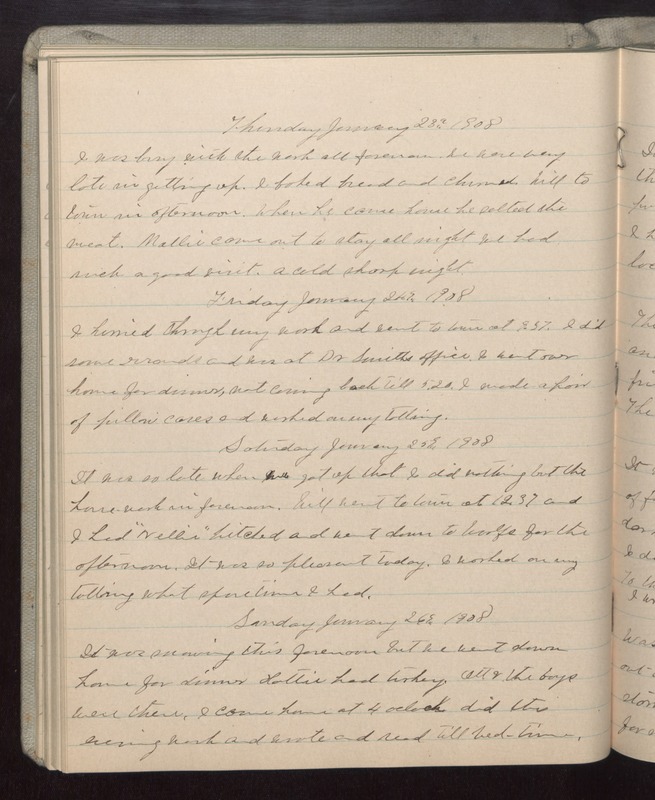 Sunday January 26 1908 It was snowing this forenoon but we went down home for dinner Hattie had turkey. Ott & the boys were there. I came home at 4 oclock did the evening work and wrote and read till bed-time.